Most of us would be familiar with the Dr. Deming’s Funnel experiment in context to Management theories. For the benefit of those who could not read this useful theory of management, let me briefly explain the same. Dr. Edwards Deming who is said to be the Father of modern management designed a funnel experiment to explain that if you adjust a process in response to any random variation, you would be over-adjusting the process. Random variations usually occur in all streamlined processes. These may be allowed to occur in the process. Over-adjustment actually induces more variation in the process than would occur if a random cause is left alone. 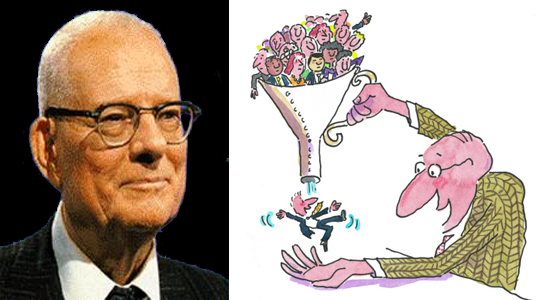 The funnel experiment is a famous illustration by Dr. W. Edwards Deming to show the adverse effects of adjusting a process when not required. It is aimed at running industrial businesses in a way that any process in an industry should not be disturbed just because some random variations occurred in it. Trying to re-adjust the process, say the parameters of a process for trying to prevent normal variations may lead to disturbing the entire process itself such that it might not regain normalcy again at all, or might induce loses much more than what the normal variations could have made in the process. I think the essence of this management theory is now understood well by the readers who have not read it before, and so illustrating and describing the actual experiment typically using a funnel is not necessary here. What is essential is to understand the finer points of this management theory and realize its potential in context to the relationship matters in life also. We develop and try to maintain good relationships in our life both professional relationship as well as personal relationship. Let us first discuss the professional relationships that we make in our offices. There is always linkage amongst all the employees working in a business enterprise. Some are closely connected such as your connectivity with your immediate superior and connectivity with the persons who are regularly reporting to you at work place. Some linkages are not that direct and one connects with them only occasionally or as per the requirement of the office. You may find that you have not had any communication at all with certain people in your organization since years, but then if you think that you are not at all linked to them you are sadly mistaken. You must be ignoring the unseen connectivity prevailing with them in the background through a series of other people. The crux of the matter is that connectivity with all people in the organization is always there in some manner. When connectivity exists then surely relationship also co-exists. It may be very strong or just normal or may be not very direct. It is also not a question of the relationship being bad or good. It can vary with time as well as with your own position in the business enterprise. Advising methods for converting bad relationships into good ones is not the aim of this article. The objective is to impress upon the people that if we try to make adjustments to some little variations occurring randomly in their day-to-day relationships with other employees in the office then there is more danger of it being turned sour rather than be corrected. Let us take an example of your professional relationship with your superior. There might be days wherein you would get a feeling that not everything is hunky-dory and that your e-mails or verbal communications to him/her are not getting the usual prompt favorable reply. This kind of variation from the usual phenomenon can generate disturbing thoughts in your mind and you might immediately start planning some acts to counter the variation. This can instigate you to carry out activities to go out of your way to connect to your superior such as visiting his/her cabin under some pretext but without a valid reason, making calls for informing little-little things just for the heck of speaking to him/her, roaming near your superior’s cabin most of the time even at the cost of your own duties, trying to probe the ‘mood’ of your superior through junior people of his/her office, trying to get in his/her cabin for some stupid excuse etc. By such acts you are doing nothing but trying to re-adjust the normal and not-so-important variables that keep coming up in any process. Your superior during those times can himself/herself be under some extra stress due to professional or personal reasons which led him/her to have lesser communication with you. And in that case the over-adjustment acts carried out by you can surely cause additional problems and disturb the normal scenario (the process) i.e. the normal relationship you have with your superior. If such re-adjustments go beyond a certain tolerable limit in the office then you may really find the relationship with your superior (the process) subsequently going entirely wrong because of the disturbances you caused to ‘re-adjust’ when the same were not required. At a higher position in a business enterprise you may at times have to speak to your team members in some stern voice to make things happen. Many times fabricated angry words have to be used during an official meeting to express the severity of a matter, which otherwise is likely to be taken as a matter of routine by the team, and for quicker implementation of the error rectifying jobs. Apart from not-so-kind words emanating from the ‘boss’, his/her body language at that time and the facial expressions directed towards a specific member in the meeting room could be a cause of greater disturbance to the sub-ordinate. When such an episode takes place in an office it is again the time for the boss to remember the Demings’ funnel experiment. Soon after if he/she tries to soothe out the matters with the concerned subordinate or with a set of subordinates by attempting to ‘re-adjust’ using the powers he/she has as the boss, then matters would go to worse from bad as far as the implementation of the rectifying job is concerned, and also it will get established as a bad example for future. Repeated acts of similar kind by the boss towards a subordinate will make the sub-ordinate thick skinned enough so as to await such a blast by the boss and then expect it to be treated with a soothing lotion (an act of undue favor which could be detrimental to the morale of other employees) for double benefit. In all possibility such bosses experience a plunge in their credibility as fast as the plunge in profits by their business enterprise due to such re-adjustment attempts by them. The same theory holds as good for personal relationships as it holds for professional relationships. On personal front we often try to re-create relationships with individuals or with families with whom we have been enjoying steady relationships over the years, as soon as we develop a feeling that the steady graph has taken a dip. There is nothing wrong in correcting the reasons if the dip has really taken place. But if it has not, then our over eagerness is bound to cause problems at some stage. This aspect is more of a feed material to our thought processes in our minds so as to think and prevent it rather than to explain it through several domestic examples in our life. If we are enjoying a ride in our car at a good speed (a normal process) and if have to apply the brakes for a while due to an interruption on the road (random variation) then any kind of re-adjustment thereafter (increasing the speed higher than before) can prove to be quite fatal. Dr. Deming has established this funnel experiment for us for business practices, but we can very well utilize the same in relationships also.